Man, this is a good beer. Deschutes' Abyss Imperial Stout has the heartiness you want in a stout, plus some extra flavor and strength, all kept in balance to make it easy to drink. And the flavor just stays on your tongue. The label could scare you away: "Brewed with licorice and molasses". Whatever licorice is in there just gives a nice edge to the bitterness, without becoming the predominant flavor. There's Dave next door busting the myth that light can shine right through the Abyss. Last year, there seemed to be plenty of this goodness to go around. At least, Dave always seemed to pull one more bottle out of the fridge. This year, the hype got out of control, and if you didn't have cat-like reflexes -- or have a neighbor with cat-like reflexes -- then you didn't get any. It sold out in about three days, despite the $10 price tag per 22 oz. bottle. I would like to think that it was the GABF gold medal that caused all the hype, but my fear is that the hype came from the "Best Stout in the World" label pinned on it by the tastemeisters at the Men's Journal. It's even appeared on Ebay already -- sorry, not the beer, just the unopened collectible bottles, since Ebay doesn't generally allow sales of alcohol. [Update: the bottle in the link went for $21.50 plus $10 shipping. The most egregious sales were done with Ebay's "Buy it Now" feature: I counted 8 bottles that went for $45-$50 each plus $10 shipping (assuming they needed to be shipped).] Oh, great, is beer going the way of concert tickets? The day it's released you jockey for a few bottles; if you're lucky you pay a "convenience fee" to get the beers you want; otherwise, you pay a king's ransom to a beer broker who was clever enough to snarf up the bottles. I like the wife-proof packaging of Abyss, but it's really a stretch to say that some wax on top of the bottlecap makes it collectible. 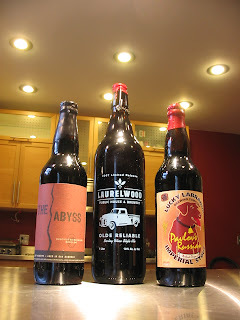 Laurelwood's Olde Reliable Barleywine has wax on it; Lucky Lab's Pavlov's Russian Imperial Stout has wax on it, are those bottles collectible? They even look cooler than the Abyss bottle. Are they being scalped on Ebay? Nope. Speaking of Pavlov's, Dave and I cracked a bottle of that right after the Abyss. Of course, that's a tough act to follow, but we found the Pavlov's to be a little too sweet, almost syrupy, and not very long in the finish. On the plus side, there are a lot of interesting flavors. Even though it didn't compare favorably to the wonderfully balanced Abyss, it would probably make a good dessert beer after a hearty meal. No wax on the cork, but the Lagunitas Cappuccino Stout deserves a mention...darker than a latte but just as creamy. Now if only they would put that in their barrel and age it. I guess I like Cappuccino Stout OK, but I never crave it like I do some things (including some Lagunitas things, like the Red). Speaking of Lagunitas, after Carla and I split an Abyss watching the Super Bowl, I cracked a Lagunitas Imperial Stout. Tasty, but of course didn't measure up to the Big A. Tough act to follow. Also in the "deserves a mention" category, Caldera Imperial Stout. And since this started out being about the "Best Stout in the World", I have to mention a couple of gems that the PIB has served: Nogne O Imperial Stout and de Dolle stout.